April | 2012 | GameXcess.net - Gaming News, Videos and Editorials! Valve has officially announced that they plan to release an editor which will give players at home the opportunity to create their own challenge rooms. Dubbed the “Perpetual Testing Initiative” DLC this editor, coming for Mac and PC will allow owners of Portal 2 to create their own Portal puzzle rooms and test in them. I would make a joke here about Wheatley wishing he could have this type of technology but instead I will just show this short informative film. The Portal 2 Perpetual Testing Inititive will release through STEAM and have fully integrated STEAM functionality. You can expect it to be released May 8 to owners of Portal 2 on the PC and Mac. While there was no mention of a console version of this, remember, if you have a copy of the game on Playstation 3 you may also have a CD-Key included in the game’s package for a free copy of Portal 2 for PC or Mac on STEAM. For those of you close to my neck of the woods I wanted to give you a heads up that a gaming and anime convention is going to be hosted at Quinnipiac University this weekend, and is going on right now as I type this. Quinni-Con 2012 is a free fan-created convention hosted by Quinnipiac University. The convention’s primary theme will be anime and otaku culture. There are going to be panels of all sorts of subjects, cosplay and there will also be gaming tournaments for Street Fighter x Tekken, Super Smash Bros Brawl, and Soul Caliber V.
Details about the convention can be found here. Online web registration is no longer active but on-site registration is being offered. If you’re a fan, go and give it a look, it’ll continue on through Sunday! Every year in Texas a celebration happens for all things made by id Software. Responsible for games such as RAGE, Doom, Quake and Wolfenstien, the Quakecon was originally a fan created convention so people could get together, discuss their love of the games, and play against each other in the games that they love. Quakecon 2012 is going to be happening at the Hilton Anatole Hotel in Dallas, Texas August 2nd to August 5th. Registration is now open. Price is free to all attendees but if you wish there are still packages available for purchase that include swag like t-shirts and posters. Registrants can go here to register. Game on! This is the long-awaited eleventh gamexcess.net podcast, and by request I’m keeping it old-school, and you really can’t get more old-school than the Unreal series by Epic Games. In this new podcast, Maniac talks about the glory days of the original Unreal Tournament, LAN Parties with Linux users, being one of the first people to see Unreal Engine 3 and all the great steps and not so great steps that the series has taken over the years! Well, it’s confirmed, a new God of War game is coming exclusive to the Playstation 3 and it is going to be titled God of War Ascension. Take a look for yourselves at the initial release teaser. As someone who has played through every God of War game made (and done a pretty lengthy podcast about the series as well) I wanted to make a reference to a few images in the teaser, and what may be coming in the game. The game is expected to take place at the very beginning of the series, which we had only seen glimpses of in the original God of War. As was shown in that game, Kratos had pledged his soul to Ares years earlier in order to help him defeat the Barbarians. In exchange for his loyalty, Kratos became a servant of Ares, and was given the Blades of Chaos (the first version of the classic chain blades Kratos wields). When Ares betrays him and makes him accidentally slay his wife and daughter, Kratos renounced his loyalty to the God of War and for his actions became cursed by the local Oracle to wear the ashes of his wife and daughter on his skin forever. The game looks to take place at the time where Kratos rejected the oath he took to Ares, and all the consequences that must have come with it. Some of you may have recognised the narrator’s return immediately. In the first game, she was simply the narrator, but in the second game you discovered the narrator was the Titan Gaia, who had been watching Kratos throughout the events of his life. It’s nice to hear that she has returned and hopefully she will continue her narration through the new game. There were also references to some classic enemies that Kratos has fought in previous God of War games, in particular the cerberus appears in the announcement video, which shows it may be returning as an enemy in this game as well. Other artwork, in particular the early game box art shows an image of Kratos bound very similar to Atlas the Titan was in God of War II. It would be a very gripping metaphor if this image made it into the game as it turned out in God of War: Chains of Olympus that it was Kratos who had originally bound Atlas to hold up the Earth after he tried to destroy Olympus and the rest of the world with it. God of War Ascension is coming exclusive to the Playstation 3. Straight from Rockstar’s Official Website, take a look at what PC owners will need to be sporting to play Max Payne 3 on their PC. Max Payne 3 is coming to the PC May 29th, 2012. Max Payne 3 is also coming to Playstation 3 and Xbox 360 and May 15th, 2012. The Xbox 360 version of Max Payne 3 will come on two discs. The game will make full use of the Rockstar Games Social Club, just like LA Noire and the upcoming Grand Theft Auto 5. Today, Rocksteady has announced that Harley Qunn’s Revenge, the highly anticipated final downloadable content for Batman: Arkham City, which has been teased for the past few days will be released on May 29th, 2012 for Batman: Arkham City. On that day, for those of you who have not yet picked up the game, Batman: Arkham City will see a re-release in the form of Batman: Arkham City Game of the Year Edition which will include the full game as well as ALL downloadable content released for the game AND Harley Qunn’s Revenge. Take a look for yourselves! Batman: Arkham City Game of the Year Edition is coming May 29th, 2012 to Xbox 360 and Playstation 3. In the United States, a free download of the animated movie Batman: Year One will be included. It’s time for a rare Saturday editorial guys. At PAX East 2012 I couldn’t help but become interested in seeing Lollipop Chainsaw. 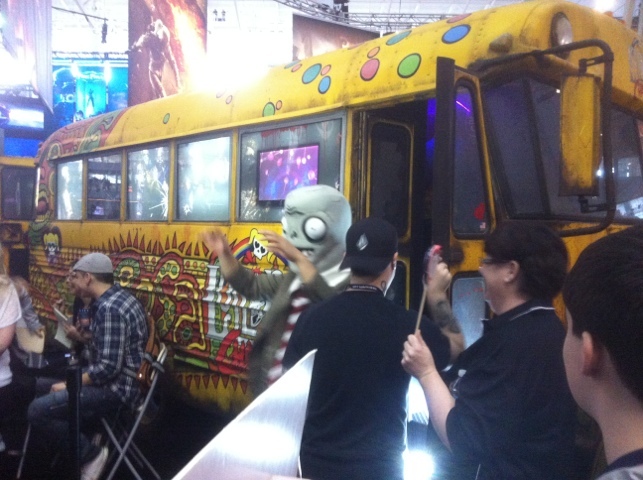 The developers really went all out, bringing a bus into the show floor, and it wasn’t just any bus, it was a living replica of the bus featured in the game! Here’s a behind the scenes video to show you what I’m talking about. It really was a sweet idea and you could tell a lot of care was put into every single detail about it, and was assembled by people who were probably the best at what they did. But the problem with it wasn’t in its construction, it was in its design, in particular the problem was its size. As you could hear in the video, there were only four demo units inside the bus. Now this was likely due to reasons of comfort and safety, but that meant that only a maximum of four people could be demoing the game at any given time. The typical time frame for a live demo of a game is about thirty minutes. So that means, theoretically that if only four people could see the game every thirty minutes, a line filled with just several dozen people could take hours to clear. So not only were the lines long and took a while to move, when it did move it was only by a tiny amount. A large handful could cap off a line just a few hours after the show started for the day, and that’s exactly what happened on the days I was at PAX East. – Ed: I’m guessing at that timeframe based upon average time of every other game I’ve seen demoed live at events and memory of the line, I didn’t get a chance to see the game demoed but if anyone did could they please post how long the demo was. The objective of these trade shows are to promote your games and generate buzz among as many people as possible before the game releases. I understand the desire to have lines to keep order in crowded events, but many developers just did not take into account the massive amount of people that had sold out PAX East for months prior to the event. Having booth setups to accommodate the large yet expected crowds is just practical and if planned properly very possible, and there were many publishers who had properly designed their booths to accommodate the sold out show. This was all I was able to get of Lollipop Chainsaw at PAX East. Really wish I could’ve seen more. I’m a huge fan of Suda51 since the first No More Heroes and I can’t wait to play this game when it releases. Lollipop Chainsaw is coming June 12th, 2012 to Xbox 360 and Playstation 3. Maniac and diskreader both give their final thoughts about 2012’s PAX East in Boston. Maniac from the perspective of a journalist and diskreader from the perspective of a paid attendee. What did they see? What did they think? Are they going back? Watch the video to find out. Ladies and Gentelmen, I present to you the Red Team and the Blue Team. Halo 4 coming November 6th, 2012 exclusive to the Xbox 360. And just as an added bonus, here’s some ways to help you remember the date, or you know, you could just preorder.